Groundhog Day has come and gone, which mean we’re on our way to spring – and garden planting season! If you’ve cut out gardening this year from your spring plans because of physical limitations, we’d like to introduce you to raised bed gardening. Raised gardening and planting beds can provide many benefits to a gardener or landscaper with knee or back problems. They also open up opportunities to for disabled or wheelchair bound gardeners to get into the yard. Planning the right level of the beds can make gardening approachable for these populations that otherwise wouldn’t have been able to consider gardening. The majority of people choose to have raised beds because it makes gardening and landscaping easier and the plantings do so well. There are also other advantages to introducing raised beds into a landscape design. A flat landscape can become a multi-layered yard. Additional visual interest can be added because of the different types of building materials used. These beds can be made from wood, brick, stone, concrete or logs. Raised beds that are built of wood blend into the space providing a more natural look in the landscape. Introducing raised beds that are built of stone can add beautiful stone retaining walls into a garden or landscape site making it a more formal setting. Stone retaining walls can also be topped with natural stone or bricks providing a reflecting bench or additional seating for guests or gardeners. With a raised bed, your soil will be warmer so you can plant earlier in the season and enjoy a longer growing season. You’re also able to create greater drainage. In areas where the native soil is clay or sandy the real advantage is being able to create and adjust your own soil composition. A raised bed in your yard can be a focal point and planted with a variety of plant materials. 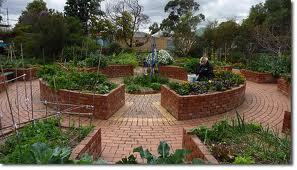 It can be a garden with vegetables, one for cutting flowers, or plants for attracting birds or wildlife. Raised beds can also be planted with trees and shrubs. If you’re interested in learning more about the advantages and drawbacks of raised bed gardening, please visit our blog archives and read one of our earlier posts on the subject. If you have questions incorporating raised beds into your landscape design, feel free to give us a call.